There are many situations that require individuals or groups to book varying time blocks. For simple booking situations, when you need to make a few spaces or time slots available to a limited number of clients, Teamup is a great tool. A tennis club uses Teamup to allow members to book time on the tennis courts. A social gaming community uses Teamup so members can book times for coordinated game play within alliances. In many cases, the booked times change from week to week, or even from day to day. Thus, recurring events are not a good solution for these situations. Having a single calendar administrator input all the booked times ends up becoming a lot of work for that person. The ideal situation is to enable the individuals or groups to book their own time, as needed, on the calendar. 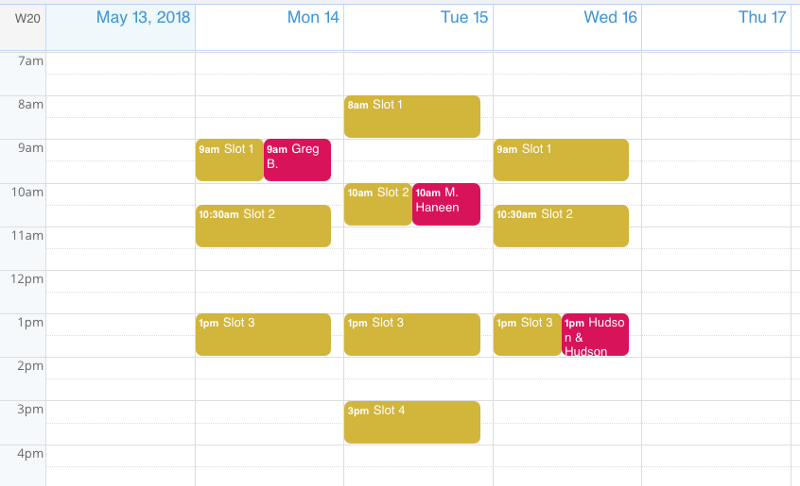 a shared calendar with an overview of all bookings. 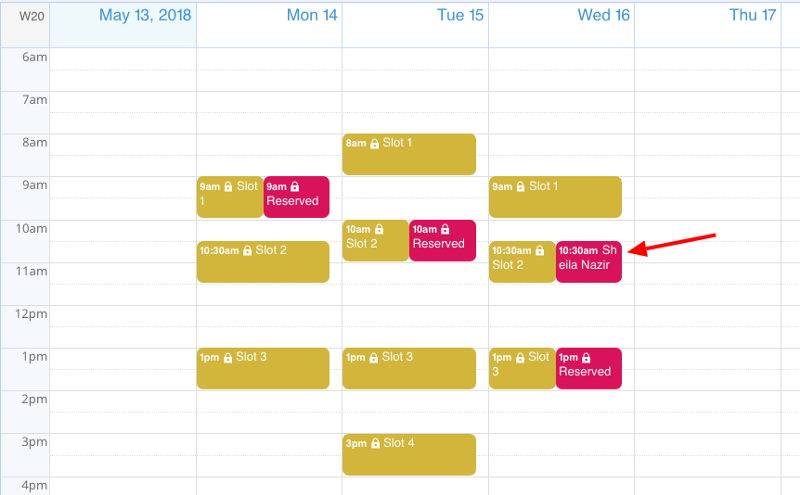 an easy way to allow multiple people to access the calendar for bookings. 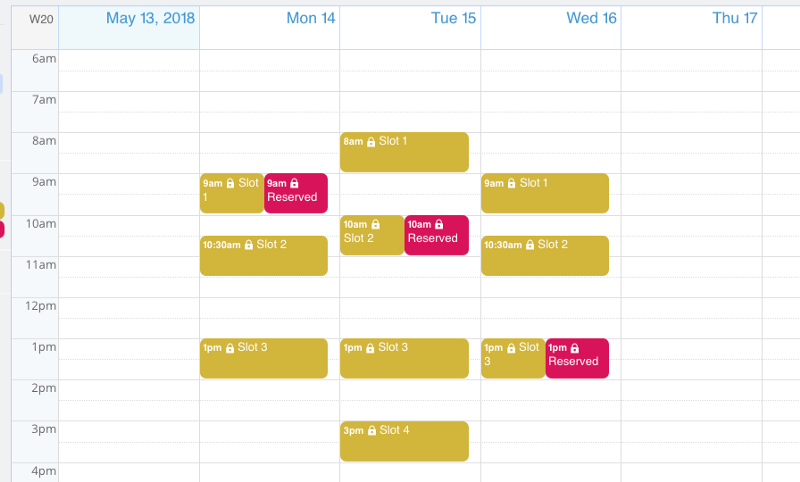 a simple way to show open/available time blocks that can be booked. a way to protect the calendar data that shouldn’t be shared or modified. Teamup provides these needed features. There are two primary ways you can manage booking with Teamup. One way to manage booking with a Teamup calendar is with designated sub-calendars. Here’s how you could set it up. Let’s use a scenario for a consultancy that wants to offer appointment times to their clients. First, you would add a new sub-calendar that shows the available appointment times. We’ll make it yellow. Then you’ll add a sub-calendar that your clients can use to book their appointments. Make it disallow overlapping. This way, you can’t have accidental double-booking of a single time block. We’ll make this one pink. Next, create a calendar link for each client. Set the permissions so that it is read-only for the available appointments calendar, and Modify-from-same-link no details for the booking sub-calendar. With these permissions, each client can view and modify the appointments they make themselves, but can’t view appointments made by others. They’ll merely see the space as reserved, if it’s already been booked by someone else. Use customized permissions to protect the privacy of your clients. 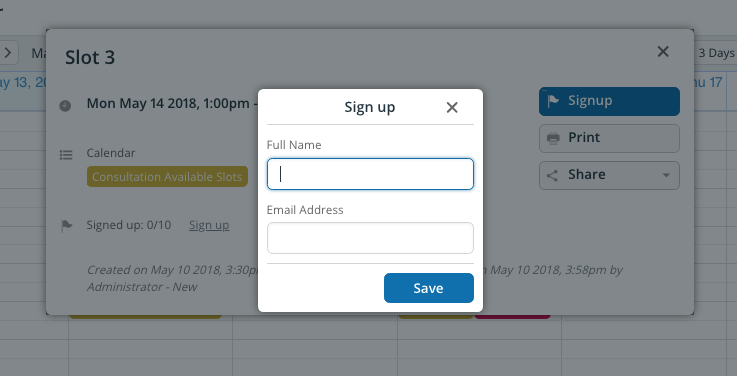 Your view of a booking calendar with three slots taken by clients. The client will see their own details, but no one else’s. Another way to manage bookings is to use Teamup’s built-in signups feature. This method works well if you need to allow multiple participants for a single time slot. First, enable signups on the time slots you’ve created. You can set a deadline for signups. Set the maximum number of people you can allow for the time slot, as well, to avoid over-booking. Next, create a calendar link to share the available time slots with clients. Set the permissions to read-only. Now, a client can open the calendar with their link. They click on the time slot they want to book, and they’ll see a blue Signup button. When they click the button, they can add their name and email address to signup for the time slot. People can book time slots using the Signup feature that you enable on any event. 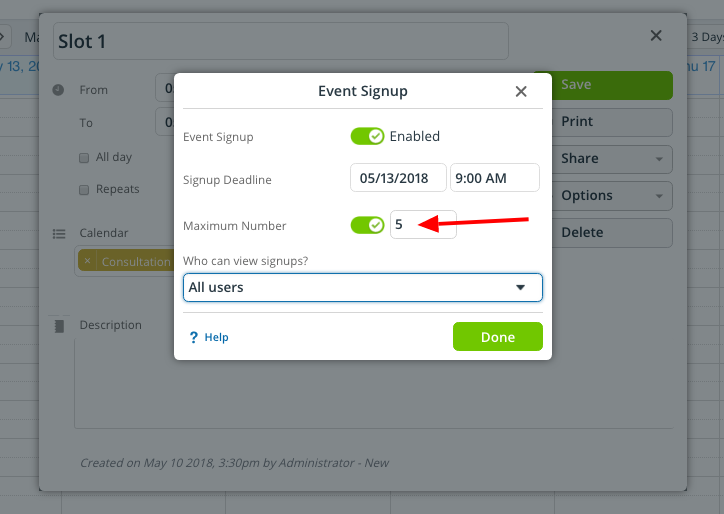 To show if an event signup is open or full, you could create a custom field and display an emoji in the event title. See an illustration on Instagram. When you enable signups, you can choose who sees the list of people who have signed up: anyone, or only users with modify permission. If you choose to only allow anyone to see who’s signed up, they’ll see a list of names on the event. The email addresses will be hidden automatically to protect privacy. Here’s more information about using the Signup feature. How could you use bookings to manage your spaces, appointments, clients, and employees? Get more ideas from our Wall of Love. Header image by William Iven on Unsplash.